My dad invited us to join him in Las Vegas for Christmas. We were excited that Arya would get to spend more time with Grandpa and meet her aunty for the first time. But Mommy and I were both nervous about getting there. Packing for baby’s first airplane ride turned out to be more stressful than baby’s first airplane ride itself. 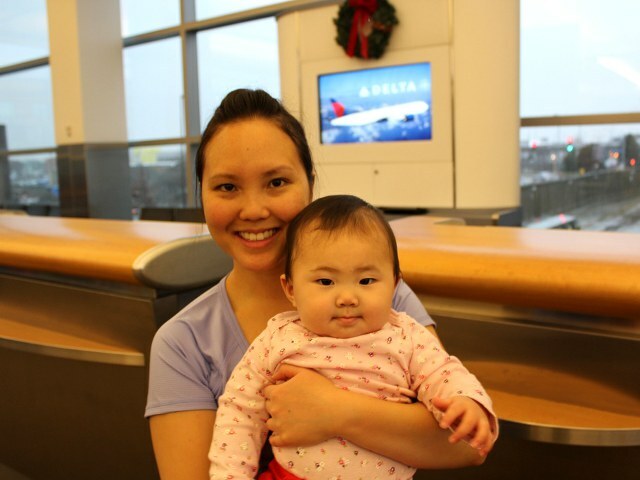 With flights packed during holiday season we weren’t able to get a direct flight at good travel times for our baby. Instead we focused on finding two shorter flights with a one-to-two hour layover between to give Arya some time to rest and recharge between airplane rides. So when packing for baby’s first airplane ride we had to account for two flights and the four day trip. We prefer to avoid checking bags whenever possible. Not only do we avoid excessive bag fees, but we also avoid frequent lost luggage and extra wait at the carousel. It’s hard enough to pack for ourselves without checking bags so packing for a baby as well was particularly difficult. We were flying Delta, which allows free gate checks for baby strollers and car seats. There are different airline policies for baby strollers and not every airline allows gate checked strollers. Worse yet, some airlines count a stroller or car seat towards a parent’s baggage allowance. Had we flown on one of those carriers we would have had to pay to check our stroller and car seat and would have been forced to carry Arya and all her carry-on items through security. Since we could rely on Delta’s baby-friendly baggage policies we were able to fit everything for our four day trip into hand-carry luggage. Packing for baby required one full diaper bag and half a small rollaboard suitcase. We took the same amount of clothing as we did when packing for baby’s first road trip. Unfortunately we couldn’t simply duplicate our packing list because we needed to set aside items for the two plane rides. Baby’s entire diaper bag was filled with diapers, wipes, a toy, ten bottles of formula, cereal, utensils, towels, and an extra change of clothes. With just half the suitcase left for all her clothes we decided to stop at Walmart to buy formula, baby meals, baby snacks, and diapers before we drive to the hotel once we landed. It simply wasn’t possible to fit all of the required baby items plus our clothes without taking checked luggage. Thankfully we were able to load everything onto the baby stroller to be able to carry the stroller, car seat, rollaboard suitcase, large duffel bag, diaper bag, and Arya. We even managed to leave early enough to get to the airport with enough time to enjoy baby’s first time at the airport.